Eye-catching, contemporary design. Puncture-resistant. Bottom is recessed 1" that may provide air circulation in event of fire. Rubber rim on top and bottom of basket helps to prevent marring. Clear, plastic, liner (included) keeps waste content from spilling. Powder coat finish for durability. 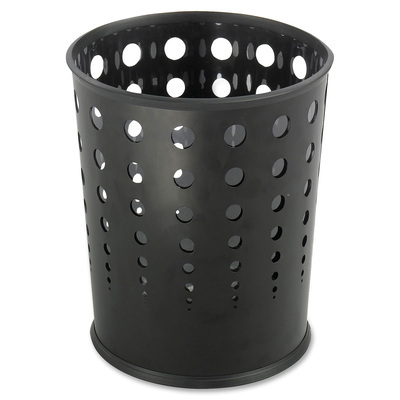 Steel receptacles are puncture-resistant with a contemporary design. Bottom is recessed 1" that may provide air circulation in event of fire. Rubber rim on top and bottom of basket helps to prevent marring. The PVC clear plastic liner (included) keeps waste content from spilling. Powder coat finish for durability.